With this product, you earn 35 FP. Freshlook Illuminate daily disposable contact lenses from Alcon are specially formulated to enhance the natural beauty of Asian eyes, providing a much more natural look for everyday use. Each lens is printed with a unique starburst pattern, which perfectly blends the coloured ring of the eye into the Iris. 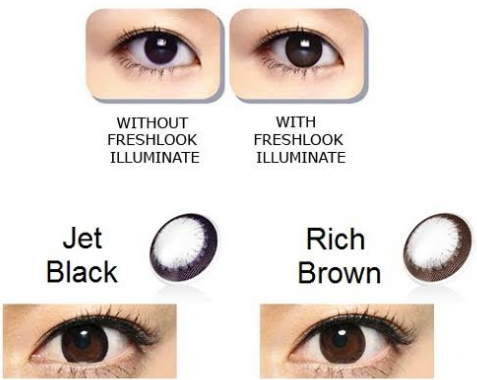 This makes eyes look naturally larger while providing shine and definition to the colour. Making use of a special dual-layer colour printing technology, FreshLook Illuminate will enhance every shade of Asian eyes. The colour of the lens is designed to interact with light, allowing it to adapt to the shade of the wearers own iris.